The idea of inserting a silicon chip into your head to augment your own capabilities is now commonplace in science fiction, thanks to the early work of writers like William Gibson. Remarkably, a silicon chip implant that mimics the hippocampus is under development. A six team, multi-laboratory effort including USC, the University of Kentucky and Wake Forest University have been working on different components of what is described as an artificial brain prosthesis. 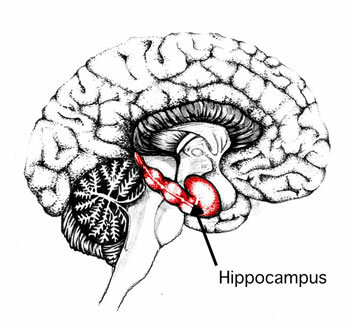 The hippocampus is an area of your brain that is important for the formation of memories; it re-encodes short-term memory so it can be stored as long-term memory. Memory disorders in aging and disease are associated with loss of function in this area; it is also often damaged as a result of head trauma, stroke and epilepsy. At present, there is no clinically efficacious treatment for a damaged hippocampus. Professor Theodore w. Berger, director of the Center for Neural Engineering at USC, leads a team that has studied the re-encoding process in slices of hippocampus taken from rats and kept alive in nutrients. They stimulated the neurons and and studied the output patterns, and arrived at a set of equivalent mathematical functions. Dr. John J. Granacki has been implementing these functions onto a microchip. When tested against slices of rat hippocampus, the chips are 95 percent accurate in producing the same output as live cells for a given input. "If you were looking at the output right now, you wouldn't be able to tell the difference between the biological hippocampus and the microchip hippocampus," Berger said. "It looks like it's working." The next step is to work with live rats; they will deactivate the biological hippocampus and then implant the microchip. It is expected to take two or three years to create complete mathematical models of a rat hippocampus; monkey models will follow in a few more years. If all goes well, an silicon hippocampus for humans may be available within fifteen years. The team will present their research this week at the annual Society for Neuroscience meeting in San Diego. Science fiction fans will remember Gibson's work in Neuromancer; he referred to chips that could be inserted into a special socket that was surgically implanted in a user's brain. The chips were called "microsofts." See Wired for the original story.